Very often vendors have a requirement to encrypt database files without restricting access for users. In this case encryption is absolutely transparent. Additionally you may allow SQL statements to be visible by SQL Profiler and unencrypted backups. 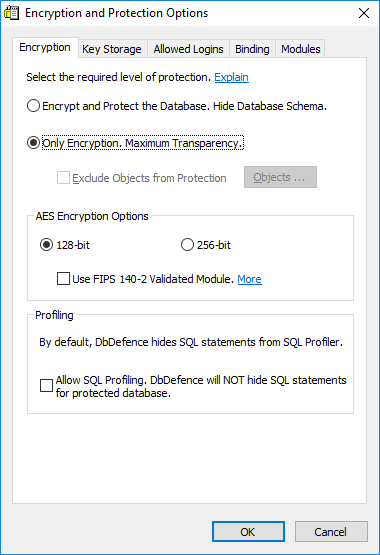 Important: with default settings DbDefence will encrypt and protect your database from unauthorized access. It will add an additional layer of security and all existing application will lose access to the database. If you want maximum transparency and don't want additional access control you need to change the settings before encryption. To encrypt the database without access restrictions, press "Change Options" in DbDefence Encryptor before encrypting the database. On the following dialog mark "Only Encryption" and "Allow SQL Profiling" (if required) as shown. Popular Question: How can I see that database is encrypted? You may compare the content of the database (or backup) after encryption. Create a backup of the database before and after encryption, then open files with your faviourite text editor. 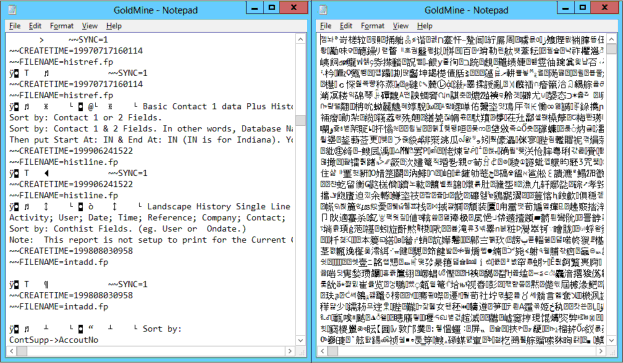 Windows Notepad can easily open and see small backups. To see the content of the database data file (.mdf) you need to stop SQL Server instance or put the database offline. Database files are usually stored in the DATA folder of SQL Server instance. Here is the difference between unencrypted and encrypted files.